The culmination of the 1999 NFL season between the St.Louis Rams and the Tennessee Titans. It would had been a ten out of ten for ABC. But I give it a eight out of nine. As I wasn't around for the Cosell-Gifford-Meredeth era. But heard a lot of awesome things and thanks to Youtube, you get to see it as well. Gifford did play the straight man with Cosell the bad cop and Meredith the good ole boy. While Michaels was a better play-by-play man than Gifford was. Gifford's name is synonymous with MNF! When they got rid of Gifford and Dierdorf, it all went downhill a bit for the next couple of years. Let's face it, Miller isn't Cosell despite not being a Cosell fan either. 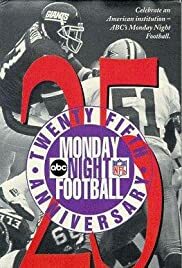 But with Madden and Michaels, both had the second best combo in MNF history. Don't like it on ESPN but now am beginning to like it since they got rid of Kornheiser. ESPN play-by-play man Tierco is OK. But glad they added Jarwoski and Gruden, who is an up and comer IMHO! It's OK on ESPN but on ABC, it is an original that can't be replaced despite new network.